This tea is produced by our wonderful tea producer Mr. Saito. His tea gardens are in Honyama, which many believe to be the area that produces the finest senchas in Shizuoka Prefecture. Saito’s tea fields are located in the mountains near the Warashina River. The environment of these tea fields is pristine and filled with natural beauty, healthy plants, birds, insects and all the good components of a thriving tea garden. Mr. Saito has shared with us another unique tea with complex characteristics. 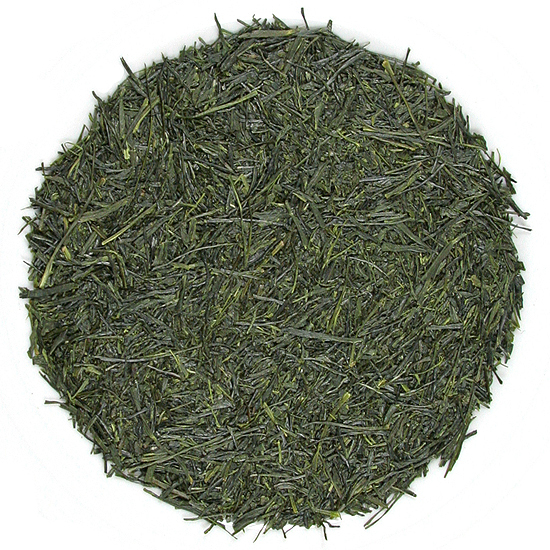 Sencha Saemidori is made from a Japanese tea bush cultivar that offers abundant flavor highlights of fresh tropical fruit and melon overlaying a lovely soft, very full-bodied, smooth base tea flavor. In appearance, the leaf is slender and medium-large, with deep color and an even mix of particle size. The color is deep forest green and the leaf has a nice matte finish. This tea is an easy steeper and an easy sipper – one does not have to wrestle with a ‘big personality’ in the cup. For those who do not want vegetal or kelpy or grassy flavors this is a splendid choice – when I close my eyes and drink in the fresh aroma of the dried leaf it is reminiscent of the subtle, softly-sweet scent of a melon vendor at the farmers market. The flavor is complex because, once the tea is steeped, layered over this smooth, full-bodied, hints-of-melon base flavor is an incredibly complex melange of tropical fruit aromas and flavors. Then in the background there is a hint of the very-popular Asian flavors of camphor and mint which serve to add a layer of spark to the smooth sweet flavors in the forefront. This is an awesome, well-crafted tea with a huge amount of style. 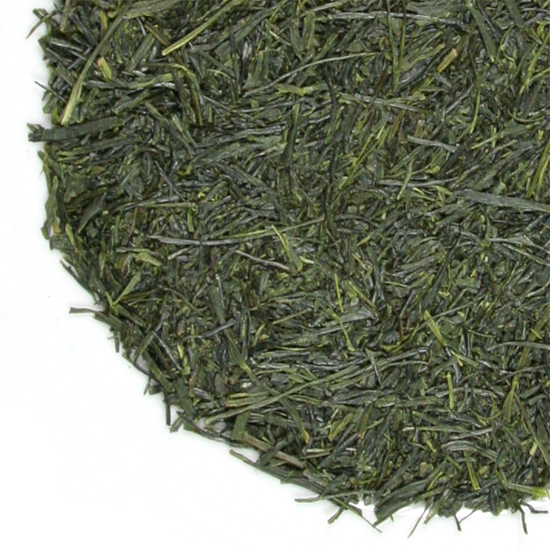 This Sencha Saemidori has an aroma that reminds us of the clean, soft, soothing aroma that one smells when the breeze picks up after a heavy rain in the spring. Fresh and life-affirming, it is perfect for a delicious spring tea. The liquor is a medium-gold color.